In France, you’re either a juilettiste or aoûtien, meaning you take your annual summer vacation in July or August, although many get more than four weeks off (and some get less), so there’s room for a few crossovers as well. I don’t know what the word for someone who takes their summer vacation during both months is…chanceux? (lucky?) – or if there is a word for those of us who go on break in September is, but that’s where I fall. However, it’s impossible if you live in France not to get swept up in the “I gotta get out of town” feeling, as places shutter up and Parisians race toward train stations and airports, with the sounds of luggage being wheeled over the uneven sidewalks, or families packing up their kids, and cars, and hitting the autoroute. While others think the French vacation is extremely generous, it’s a right the French fought for in 1936. Before that, most working-class people had never had time off, although now it’s something that’s taken for granted in France. So if you want the same thing, follow their example and hit the streets where you live. Our trip was, for me, a working vacation, because we Americans are wired differently. (Although I’m investigating how to change mine.) In the meantime, I found myself wanting to share a story and pictures of a favorite antique shop, so pulled out my laptop, and got carried away, sharing lots of photos, I think around fifty, and a story. Then we went to a local outdoor market that I just couldn’t not share with you either. Regardless, after patting myself on the back, I started to fade into the slower way of life in the French countryside, right about the time my internet connection began to fade, which happens that farther you get from major cities in France. That’s why you’ll see Parisians out in the countryside, standing in the middle of town squares or open fields, pulling on cigarettes, desperate for a network connection. At least that was us, minus the cigarettes. As we moved farther from cities, my internet connection became even more spotty – much to the chagrin of people trying to reach me, who didn’t understand that in France, in August, closed for business means closed for business. But I was glad I brought along my camera, for un petit travail, when my friend Hélène said she was going to make poulet au pastis for dinner. 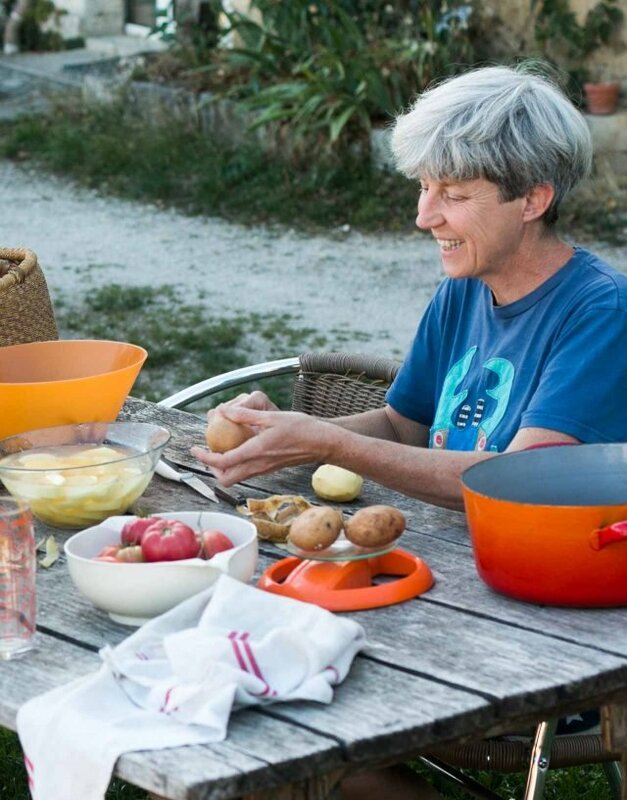 Hélène and her husband live out in the country and grow most of their own vegetables. 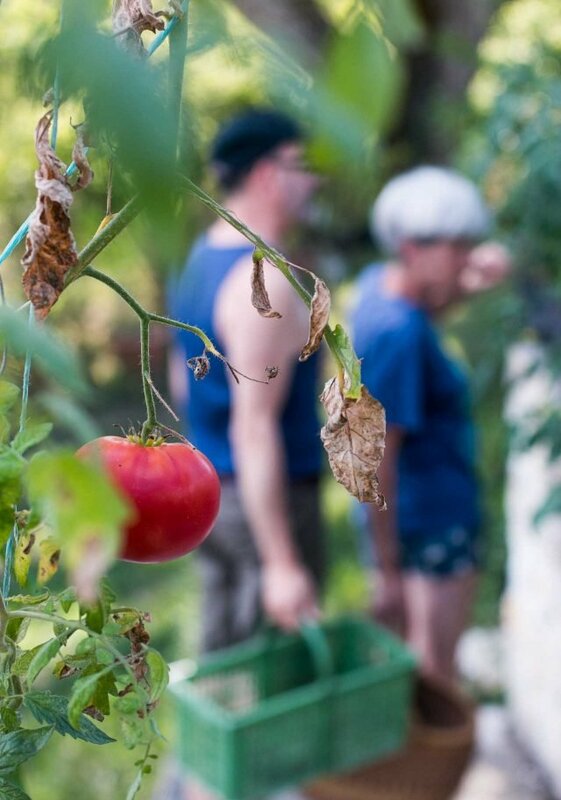 It’s easy to forget what a tomato right off the vine taste like, or how much better green beans that were just picked a few minutes ago are, compared to their counterparts that have been shipped from elsewhere. Right before hitting the kitchen, Hélène heads out to the garden to gather vegetables for whatever she’s going to make for that meal. (She also said she didn’t like thinking too far in advance what she was going to make for a meal because it was too stressful, which I think is good advice.) So I stopped pursuing an internet connection and joined her, searching for beans, tomatoes, herbs, and whatever else was ready to be picked, and cooked. When Romain first met Hélène and her husband, he stayed with them and dined at their table for a few weeks. Midway through his stay, he called me to tell me how great he felt eating so much healthy food, especially all the vegetables. (And I like to think we eat pretty healthy at home.) But our city vegetables are no match for those that are just-picked. I love vegetables, but after a few days, when we went to the market, I spotted the one last poulet fermier on display and asked if she felt like cooking it. 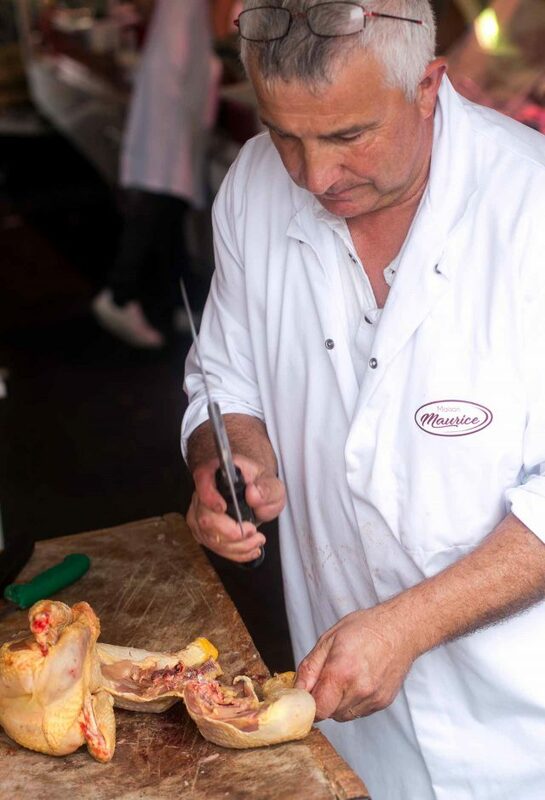 In addition to extended vacations, great outdoor markets, and gorgeous countrysides in France, butchers will cut up poultry for you. It’s part of the service, and while I don’t mind cutting up my own, they do it so much better. 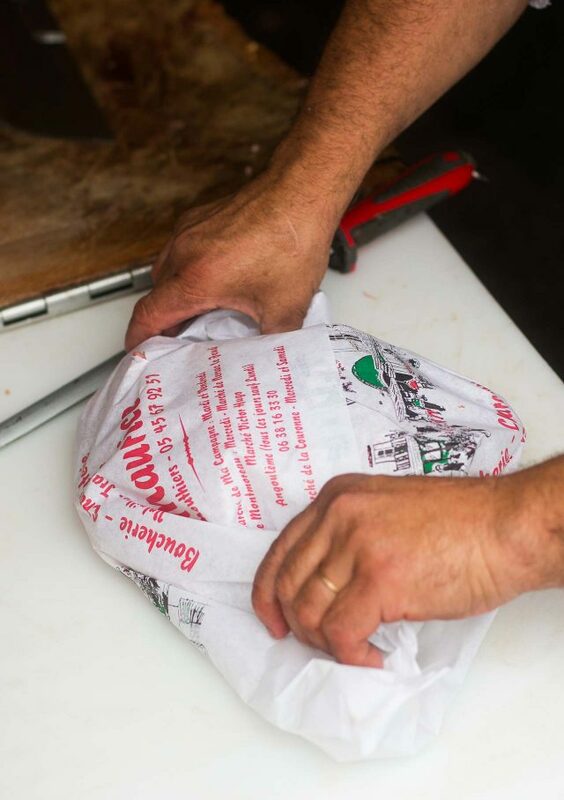 Once it’s done, they wrap all the pieces up in crisp paper, with the name of their butcher shop on it, then hand the chicken over. All you have to do is take it home and cook it. French farm chickens are less-plump than their supermarket counterparts, although you can get a poulet fermier at most French supermarkets. 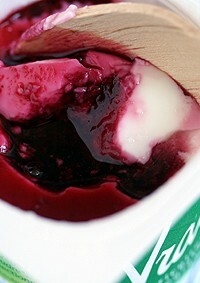 They tend to taste more “meaty,” and give off some natural gelatin, which thickens sauces nicely. To others, the chickens may look boney and sparse (I’ve seen American visitors mock the gangly French dindes when they’re invited to a Thanksgiving dinner in Paris, but the free-range turkeys are much, much tastier than their plumped-up counterparts), and I’m happy to choose the perhaps less-photogenic farm chickens, when I can. 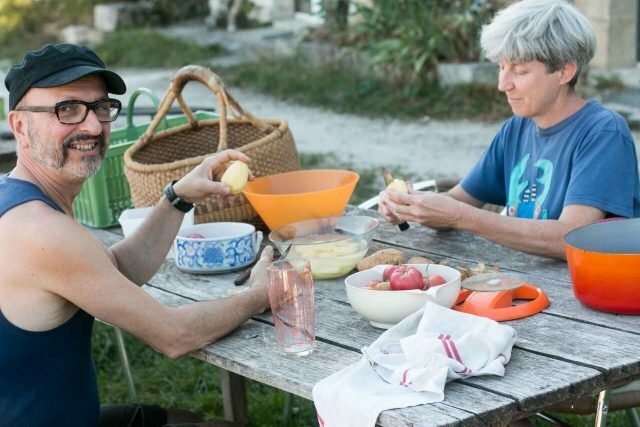 Once home, Hélène got to work on the tomatoes and potatoes, with Romain pitching in to help. When I told her that I wanted to share the recipe, and we’d need to measure ingredients, she froze. She wasn’t used to doing that, but was a good sport and out came the balance (scale), and into the pot went the tomatoes, potatoes, and other ingredients, after I weighed everything and converted them pounds and cups. When Hélène suggested adding just a suggestion of garlic, I said it was fine to ramp it up for les américains, who like a lot of ail, and she added a few extra cloves to the pot. While we’re on the subject of cultural differences (or at least I am…), when we were at the market, we talked about portion size. When I arrived in France and made my first dinner for guests, I figured the usual one half-chicken per person, as we ate in the States. I was surprised when I had so much food leftover after buying two chickens to serve at a dinner for four. 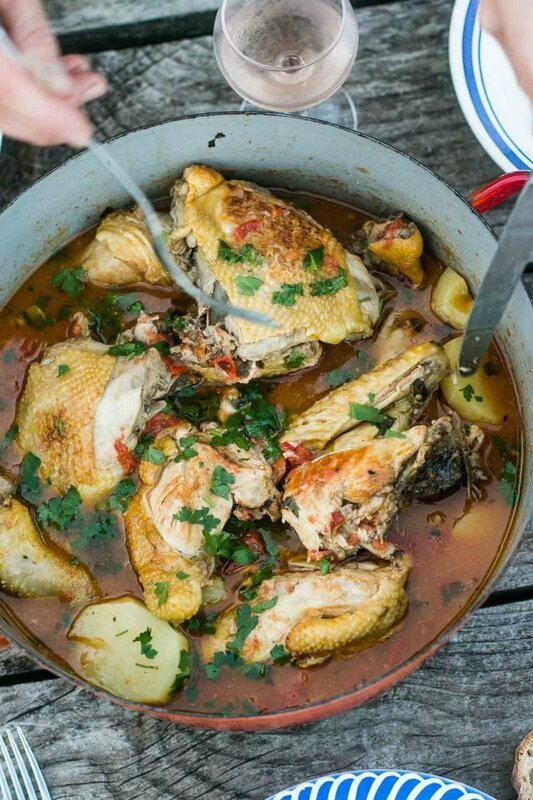 This Provençal Chicken with Pastis turned into a great one-pot meal. One last generalization is that the French generally don’t overdo seasonings, especially when it comes to spices: Herbs are used more frequently than spices. So I gave some ideas in the headnote to the recipe if you want to tweak the recipe a bit, with the addition of olives or fennel seeds, or even replace some of the parsley with tarragon. Helene doesn't cook fancy or time-consuming food, and added potatoes to her stew, along with water to help them cook. When I make it at home, I'm may serve it with wide noodles, so will add less water, enough just to cover the chicken – perhaps 2 cups (500ml). The French tend to like lots of sauce, especially if there is good bread handy, so feel free to add 1 quart (1l) of water if you're using the potatoes.When I got home (and had an internet connection), I did notice some French recipes for Poulet au pastis call for the addition of things like star anise, fennel (fresh or fennel seeds), black olives, saffron, thyme, rosemary, or summer savory. The recipe is very flexible so you can use this recipe as a base, and add any other seasonings in step #4. Personally, I'm going to try swapping out fresh tarragon for some of the parsley and add fennel seeds next time I make it.If you don't have pastis, another anise-flavor liqueur, such as ouzo, arak, absinthe, or anisette, will do. You may need to adjust the quantities, depending on the strength of the liqueur or spirit that you substitute. 1. Rub chicken all over the salt and pepper. If possible, let sit overnight in the refrigerator, although it can be prepared right away. 2. 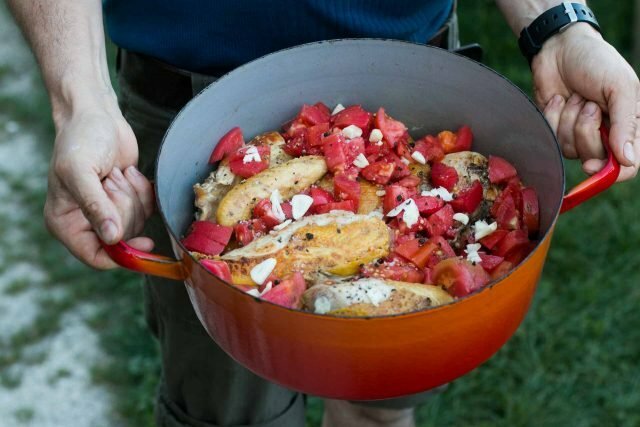 In a Dutch oven or similar vessel, add enough olive oil so it covers the bottom of the pan. Over medium-high heat, when the oil is hot, brown the chicken pieces on all sides, turning them only when one side is brown. (Constant turning won't encourage browning as much as letting them stay in one place until browned.) If your pot isn't large enough, fry them in two batches and remove the first chicken pieces to a bowl while you brown the second. You may need to add additional olive oil to the pot while browning or in between batches. 3. Once the chicken is browned, wipe excess oil from the pot. Deglaze pan with about a third of the pastis, scraping the bottom of the pot with a flat-edged spatula to incorporate any dark bits. 5. Reduce the heat to a gentle simmer, cover, and cook for 15 minutes. While the chicken is cooking, slice the potatoes into pieces 1/3-inch (1cm) thick. 6. Stir everything in the pot gently to mix everything together, then add the potatoes, half the parsley, and the sugar, sprinkling a bit of salt over the potatoes. 7. Continue to cook, uncovered, basting the potatoes with the liquid in the pot while everything is cooking, until the potatoes are tender and the chicken is cooked through, about 20 to 30 minute, depending on the variety of potatoes and the chicken. 8. Taste the sauce, and add sugar (if desired) and more salt if it needs it. If you'd like, you could give the sauce a small squeeze of lemon, to add a nice note of acidity to the sauce. Serving: Serve the chicken warm with potatoes and some of the sauce. If you decide not to cook potatoes with the chicken, you can serve this with pasta, rice, or a favorite grain. 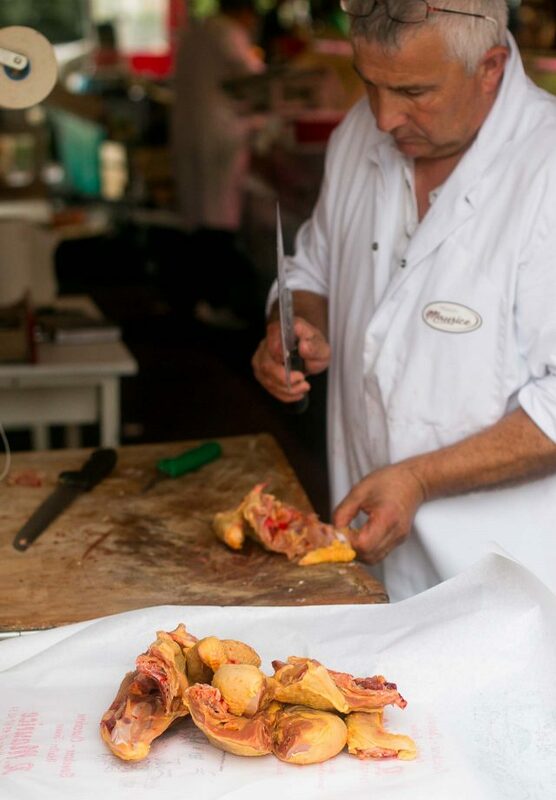 I wish our butchers understood about dissecting a chicken properly here in Italy. If I ask them to cut it up they just cleaver right through the thing bones and all! It becomes unrecognizable not to mention the bone shards! As with chickens, so too with vegetables–the ugly, misshapen vegetables (especially tomatoes) are far tastier than the perfect ones of precisely the same caliber. We choose based on perfection and color, but those things can be bred in, and taste bred out. Some of the most intensely flavored strawberries are ciflorette, which look downright wan next to the industrial strawberries. For slow-cooking recipes like this, I sometimes put the pot in the oven (not in summer, when the oven is off limits). It keeps the bottom from scorching and is good if you have other things to do than remember to stir. Yum! Definitely going to try this one, thanks for sharing. I do not like pastis to drink but do use it in cooking. There is nothing like a simple stew made with gorgeous vegetables. We are leaving Paris and a lot of my favorite restaurants and shops were closed during my visit but I still had a good time. What a great looking stew. Mmm, divine! And so nice too to see Romain making his way into a few photographs. Love his bien chic cap! Wonderful in every respect. I love Helene’s way to cook, simple, no fuss, with lots of free space for adding or not this and that which takes your fancy (or happens to be in your larder/fridge). 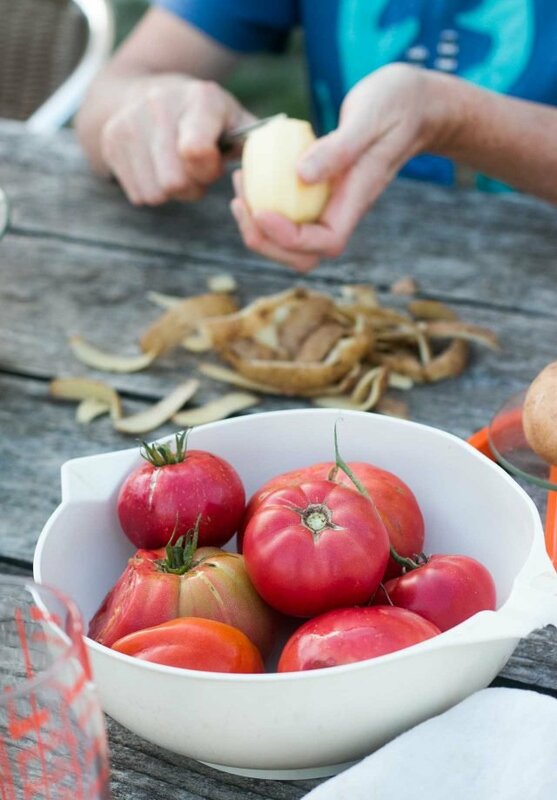 I have had an abundance of tomatoes growing myself and will probably make this recipe myself. I’m not a fan of licorice flavored liqueurs. Do you have any other suggestions or does the flavor lessen in the cooking? 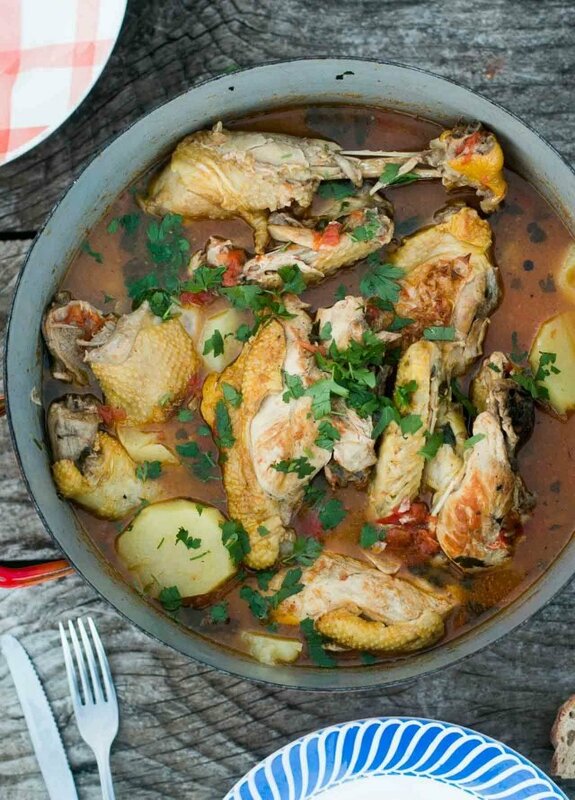 I’m looking forward to making this chicken stew! Nadia: I don’t love drinking pastis so much either (I go for the rosé in the summer!) but I like the anise flavor in cooking. I also like anise seeds in biscotti and other desserts, too. Sandra: You could try it with something like sherry or madeira perhaps? Nancy: Some butchers do just hack through the bones, but I also often direct them how I’d like it cut. I’ve never had anyone mind, although sometimes they don’t understand me. 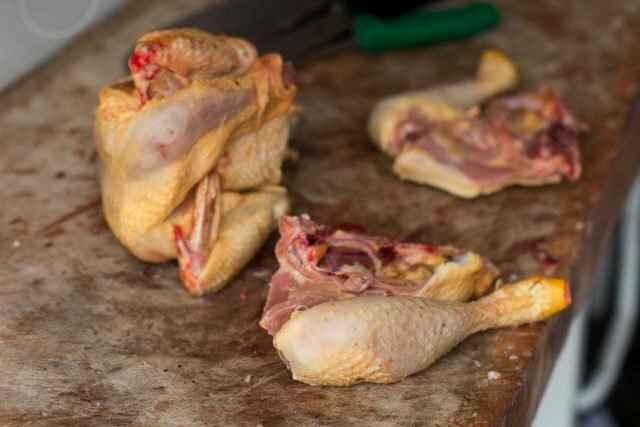 Often for American recipes, the chicken gets cut into six pieces – 2 wings, 2 breasts, 2 thighs, with legs attached – so when I’m doing a recipe that requires that, they don’t seem to quite get it, so I cut it up myself in those cases. I am surprised that peeling tomatoes is commonplace… I mean, they are not exactly the easiest buggers to get the skin off of. 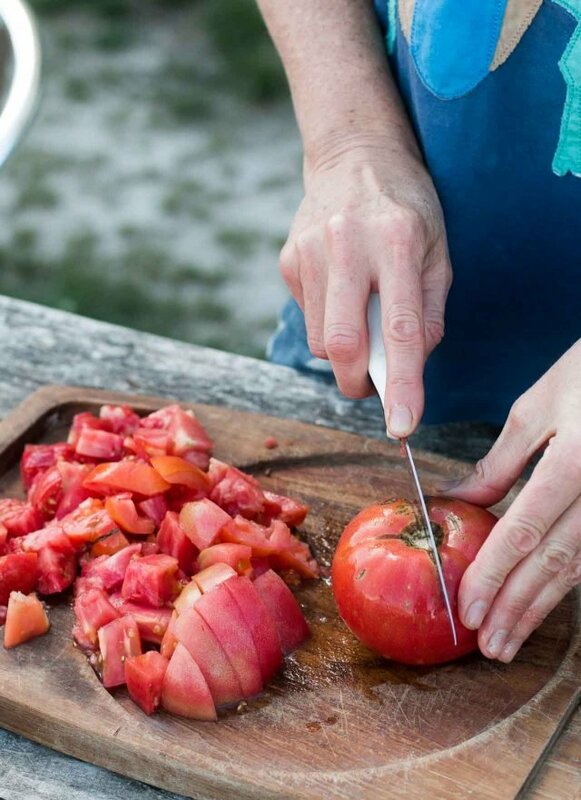 My Virginia grandmother always peeled tomatoes but it may have been that the peel tended to get slip in under false teeth. Corn on the cob was difficult, too. Dip ’em in boiling water for 30 seconds and then cold and the skins slip off easily. Last night, driving home from a party, I had been listening to Charles Trenet singing “Route Nationale 7,” about leaving Paris to go on vacation. Aaaahhhh don’t we love Charles Trenet and his gentle warble?! Your song poem reminds me of C’est en Septembre, one of the more douce songs Gilbert Becaud sang. This looks incredible! I loved eating rustic food in small, family-run restaurants in the south of France way more than the “hoity-toity” restaurants we’ve eaten at in New York, Paris, etc. (except at Noma – that an experience like no other!). David, thank you for such a lovely taste of the south of France. It reminds me of so many holidays there. 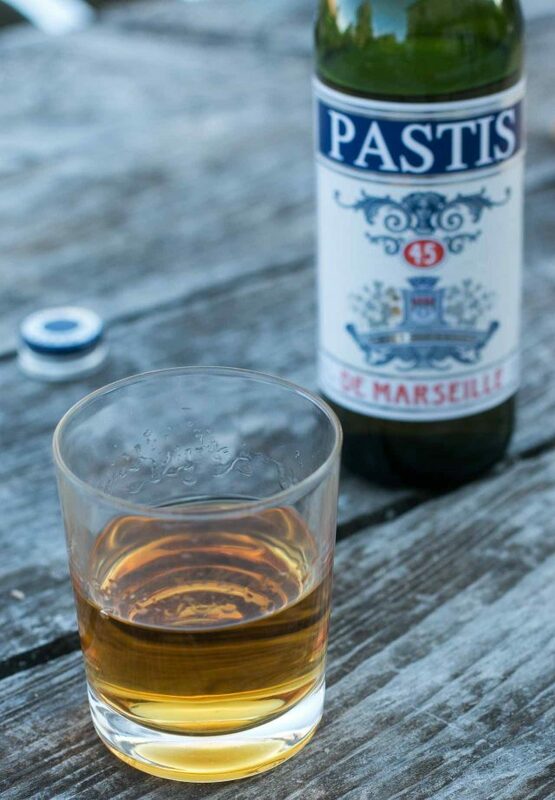 Pastis is the perfect drink in the sunshine. Wonderful post. I learned about portion sizing in Europe. My guests here in the US often comment positively that the smaller portions I serve are much better. I disagree about your substitute for chicken broth. I make my own and freeze it in portions. However, in a pinch I think the best one out there is Minors Low Sodium Chicken Base. It is on Amazon. No MSG or trans or saturated fats. It is a refrigerated product but lasts a really long time. A 1 pound tub makes gallons of stock that with the addition of some good vegetables and a bay leaf is hard to beat. What’s the big deal w making chicken broth? Fill up a pot with water salt some greens pepper other spices add 4 legs of chicken and cook for 40 minutes add lime (Mexican touch…) and there is your broth if you decide to eliminate the chicken parts (which would make it chicken soup!) Amazon does NOT improve on their broth- so help me! 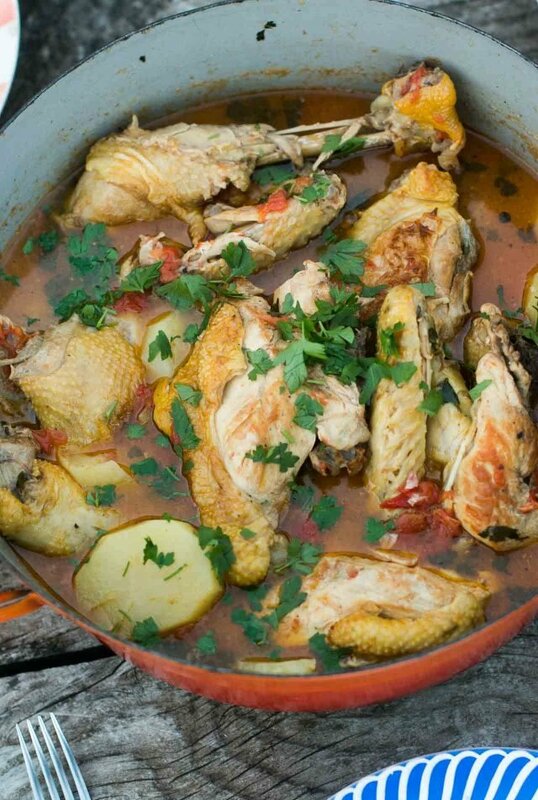 Great recipe and dinner planned for tonight since everything needed is on hand, in the garden or fridge–even enough time to marinate the home grown chicken. I much prefer home grown everything including turkey. Thanks for a beautiful post. David, After I read your blog, it never fails to leave me hungry and longing to see France again. Traveling overseas and being able to stay with friends in their home is a special treat. I have been able to do so in multiple countries and it is always an outstanding experience. I too have hosted my friends from overseas and have enjoyed sharing our home. The tomatoes in your post are beautiful and luscious. Looking forward to trying the recipe. It’s funny too that you mention your hostess peeling the potatoes because I just saw a recipe for roasted potato skins that I really want to try, even though I rarely peel potatoes myself. Roast a pile of them at 400 for 15 minutes or so…season and or sprinkle cheese and scallions on. Yum! Better than “French” fries, right? I believe I will peel the potatoes too and mine are organic. I think it makes for a slightly more refined dish. I generally don’t peel the tomatoes unless the peel comes off easily when I am cutting them. I assume I can use Ricard. Very provencale. I hardly can wait to make this stew. I have many, many chickens, plenty of vegetables, but no pastis, and I am not sure if I can find it here (New Zealand). Thank you for this recipe – it is so welcome! Elena – pastis is available at Liquorland and Glengarry. It is not impossible to make your own! That and all aperitifs, liqueurs and more are an easy and pleasurable hobby to prepare (and gift). Many recipes on the internet. These wonderful beverages are simply herbs macerated in tasteless vodka with the addition of a sugar syrup. Look them up on the internet. As soon as I saw the picture of the chicken I new it was a poulet fermier, oh how I wish I could get them here in the US. They have so much more flavor than the American chickens. When you are in the Bay Area my friends and I would adore it if you could find time to come to Bookshop Santa Cruz. They have contacted your publisher. We have wonderful beaches and there is a great ice cream shop, Penny Ice Creamery, just a block away. Looks delicious. But have to ask do you seriously mean half a chicken is a portion in the States? That’s huge!! By “cubes” I assume you’re referring to those awful dry salt-lick cubes…no argument there. But I’ve found the Knorr Marmite de Bouillon (in the boxes of little individual plastic tubs) to work well, and they’re readily available in many French supermarkets. So much flavor in this recipe! ! I cannot wait to try this recipe out, thanks for the share. 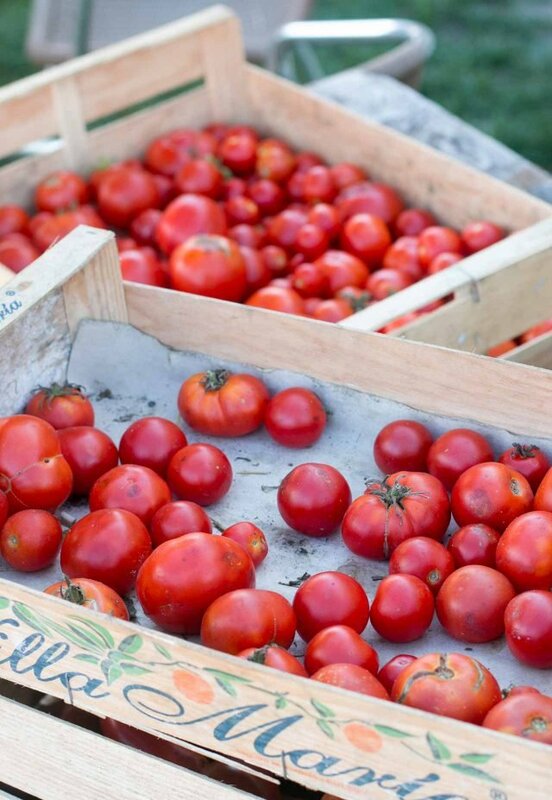 There’s really nothing better than summer tomatoes, straight from the vine. The rest of the year, tomatoes should be called something else, because they’re such a pale stand-in to fresh tomatoes from the garden. I liked your additions about struggling to find internet connection, and then finally giving up on it to live in the moment. 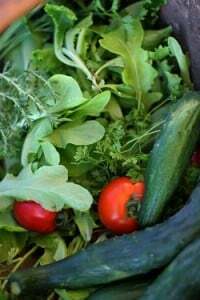 “Right before dinner, Hèlène heads out to the garden to gather vegetables for whatever she’s going to make for that meal. I stopped searching for an internet connection and joined her, searching for beans, tomatoes, herbs, and whatever else was ready to be picked. Fewer photographs!? Non! Just non! Oh, I love your long posts! It allows the reader to really sink into the mood. I am running out for a chicken today! David, I’m not sure if this is your dutch oven, but regardless, what size do you have (or recommend)? I am a new-ish cook and just got a beautiful 7qt Le Creuset as a wedding present. It’s huge! I live in a tiny (and I mean tiny) NYC apartment and was thinking of downsizing to the 5qt. Am I being shortsighted? The difference is considerable. Which will be more use to you probably depends on how many people you typically serve. If it’s almost always just one or two folks, go for the smaller size, although you may have to adjust some recipes. If you regularly like having a bunch of friends over, keep the big one. (If you don’t mind eating the same thing for a week, also keep the big one.) I have both, mostly cook for one or two, work a tiny 1903-era ‘one bum’ kitchen, and wouldn’t do without. I have a 5 qt. and find it works for two to six or maybe eight people depending what you make. My SIL has a 5 qt. too and uses it constantly. Also Le Creuset is heavy — if it were me I’d go with the 5 qt. That isn’t mine but I have two: One is a #46 Staub (which I think falls between 7 1/2 and 8qt) and the other is a #29 (5qt) Le Creuset. I bought the Staub online and when it arrived, I didn’t realize how huge it was. However it’s great to cooking things like whole lamb shoulder or leg of lamb, whereas the smaller Le Creuset one, I have to have the butcher cut those into pieces. I do find myself using the smaller Le Creuset one a lot more, but the larger one does come in handy. But if I had to get one (due to space considerations), I’d get the smaller one. But check out a cookware shop and see the difference between the Le Creuset 5qt and 6.75qt (#31) as a little larger is sometimes better if you only have one! It’s a testament to your writing and photography, David, that I’m still hungry after reading this even though I just ate a plate of chicken, an ear of sweet corn smothered in butter and salt, and a sizable green salad! To me, Pastis IS the taste of France. I think I like your alternative of wide noodles rather than potatoes with this dish–it’s how I like chicken Marbella, which I make with vermouth. Sigh, time to go nap in the sun and dream of my next move across the pond. 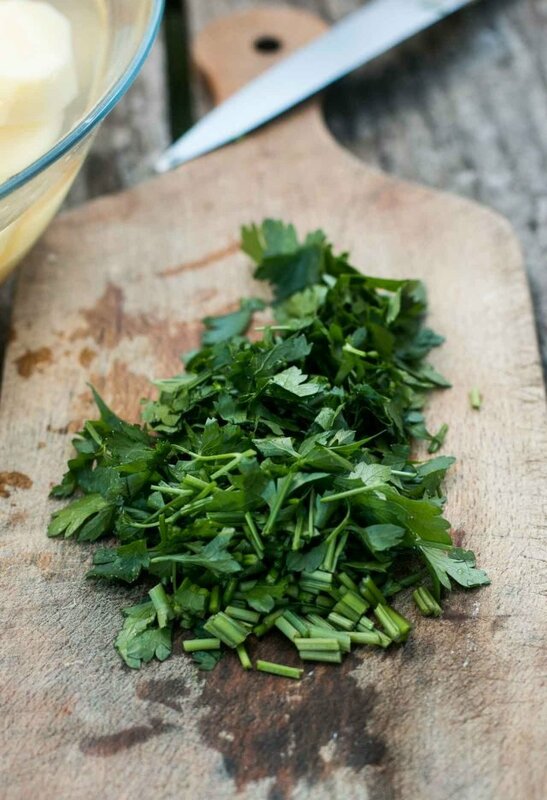 I love how Helene uses all the parts if vegetables like chopping up the parsley stems. Why am I throwing those out? Delicious recipe!! Made this today – lovely recipe! 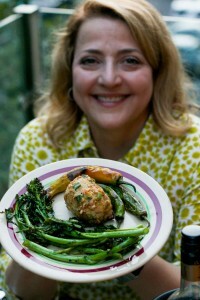 Thanks for sharing Helene’s recipe David and I love all your photos, always! Followed the recipe but needed to supplement regular sized garden tomatoes with some large strawberry sized tomatoes since I didn’t have enough ripe big ones to pick. 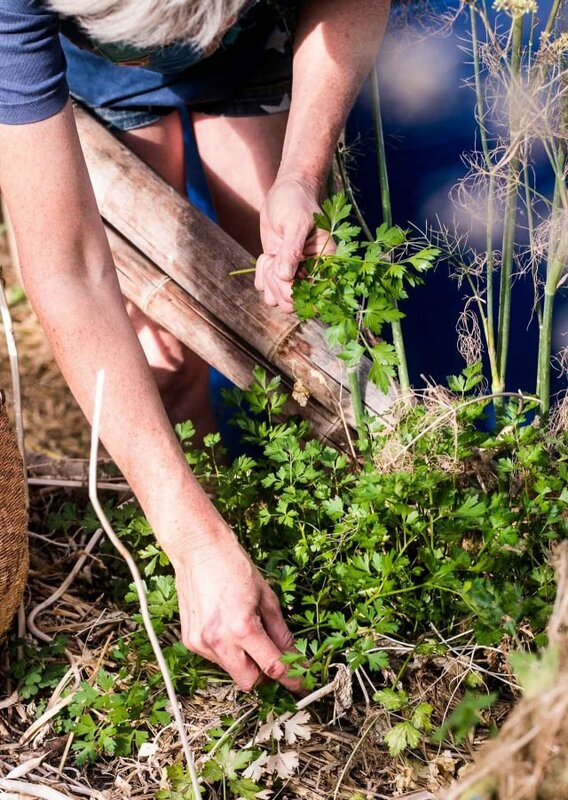 As well, chopped up a few tarragon sprigs as you suggested, along with plenty of parsley since abundant in the garden. I had picked up a small chicken yesterday under 2 1/2 lbs (1.23 kg) so added a few more chicken thighs I had wanted to use anyway, to bring it up to about 4lbs of chicken. Used Pernod as I had it for a previous recipe that I forget now – maybe seafood something? Tasted sauce at the end, adding more kosher salt and cracked pepper as was needed. Simmered a couple minutes more then tasted and added some fleur de sel (I probably had more small potatoes than the recipe than listed) plus champagne vinegar for a note of acidity, to get the sauce to that savoury, yummy point. And all that lovely sauce definitely needed bread to sop it up – delicious! P.S. For Madison’s info, I used a #29 (5 qt.) Le Crueset and it was filled to the brim with the extra chicken and potatoes, but just perfect for this recipe I thought! Lovely summer dish. I did add fresh tarragon from the garden along with our garlic, tomatoes , parsley. David, I enjoyed vicariously your adventure of gathering the ingredients, cooking the food, and then enjoying the dish. Somehow it seems something almost unique to France or to another time. Having recently moved back to the US from Belgium, I miss such adventures! Enjoy your holidays. I am going to make this recipe this weekend! Looks wonderful! Can’t wait to try it! David I love your stile of writing and cooking. It is always a pleasure reading your posts. Would you please tell me whether I can substitute Pastis with Noilly Prat in this recipe? Thanking you in advance. I’d be tempted to substitute cooked beans (like the ones used for cassoulet) for the potatoes. While I might not dare to serve this to Italian guests (they not always fond of aniseed flavour) I am pretty sure my husband would love it. I actually prefer Williams-Sonoma’s chicken stock, you might give it a try. It comes in a glass jar and only needs to be refrigerated when it’s opened. 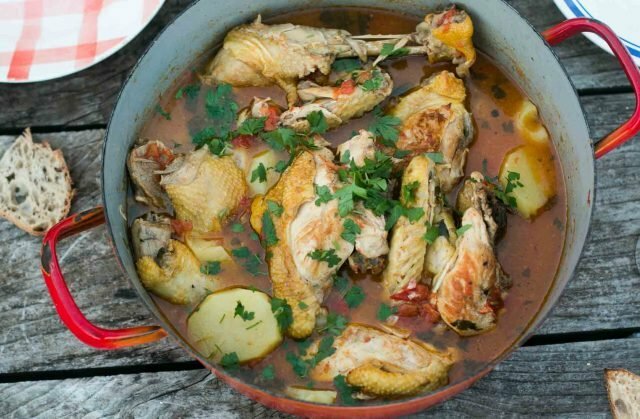 Perhaps you can answer a question I’ve always had about chicken stews – I find that after I’ve browned the chicken, and then returned it to the pot and covered it, the once-crispy skin gets soggy from the steam or liquid, and I get unnaturally depressed. Am I doing something wrong, or is crispy skin not possible in a stew? Thank you as always for your delicious and beautiful recipes. Mine is very close to yours, inspired by Raymond Oliver’s “bouillabaisse de poulet”. I had fennel which of course enhances the anised(?) flavor of Pastis. Made this last night. Next time I would use fewer potatoes and more tomatoes. And yes, don’t forget to salt liberally. Many thanks David! I just knew there was a reason I hadn’t finished off that bottle of Anisette on my kitchen counter yet… it was waiting for this! I can’t wait to try it.